The new Yahoo! Messenger 11 Beta is now available for download. The new Yahoo! Messenger Beta offers more ways connect with friends and family. Not only can you instant message, text, and make voice and video calls, you can now play social games right within Yahoo! Messenger. * Get your friends involved – Share your game activities and play-status so that friends can join your game and you can join theirs. Yahoo! Messenger Beta also brings together your social experiences from across the web and provides a single destination to see what your friends are doing or let them know what you are up to. * Keep up with friends wherever they are – View, comment on and like updates from Yahoo! Pulse, Flickr, Facebook, Twitter, and more, all from one place, right within Yahoo! Messenger. * Post one status to multiple social networks – Share your Messenger status simultaneously on Yahoo! Pulse, Facebook, and Twitter. 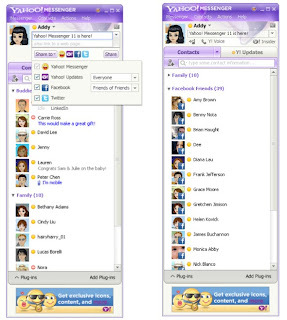 * Chat with Facebook friends – In addition to your friends on Windows Live, you can now IM your Facebook friends right within Yahoo! Messenger.